Alice enters Wonderland through a rabbit hole and encounters the White Rabbit, the Queen of Hearts, the Mock Turtle, the Mad Hatter, among a multitude of other characters—extinct, fantastical, or commonplace—while trying to fathom the meaning of her strange experiences. But they only become “curiouser and curiouser,” and seemingly without moral or sense. This classic text is enjoyed by adults and children alike. Its narrative, characters and imagery have been enormously influential in both popular culture and literature. Considered to be one of the best examples of the literary nonsense genre, children revel in the delight of its imagination, while adults speculate on its possible metaphorical meanings or on Carroll’s alleged use of opium. 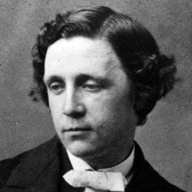 Lewis Carroll is the pen name of Charles Dodgson (1832 – 1898), who was an English writer, mathematician, logician, Anglican deacon, and photographer. His most famous writings were Alice’s Adventures in Wonderland, its sequel Through the Looking-Glass, which includes the poem Jabberwocky, and the poem The Hunting of the Snark, all examples of the genre of literary nonsense. He is noted for his facility at word play, logic and fantasy.